On education gains, the U.S. lags behind other nations and Michigan lags behind other states. Tonight, millions of Americans will tune into the opening ceremony for the 2012 London Olympics, eagerly waiting to see whether the U.S. will resume its dominance in the race for gold. If only we did so well in the race to educate our kids. "What was unimaginable a generation ago has begun to occur - others are matching and surpassing our educational attainments. If an unfriendly foreign power had attempted to impose on America the mediocre educational performance that exists today, we might well have viewed it as an act of war. As it stands, we have allowed this to happen to ourselves." Almost three decades later, the trend in mediocre student achievement continues. It's not that children in the U.S. haven't improved. In fact, we've made substantial gains since the 1980s on many educational measures. But other countries have been outpacing us. And a new report from Harvard and Education Next quantifies the problem. "... when compared to gains made by students in other countries, the progress gains within the United States are shown to be middling, not stellar ... While 24 countries trail the U.S. rate of improvement, another 24 countries appear to be improving at a faster rate. Nor is U.S. progress sufficiently rapid to allow it to catch up with the leaders of the industrialized world." Among the countries that are improving more rapidly than the United States: Chile, Brazil, Liechtenstein, Colombia, Greece, Mexico and even Iran. The country with the most rapidly improving test scores in the world is Latvia. And Latvia was already ahead of the U.S. on some education measures. Don't worry. The news gets worse. 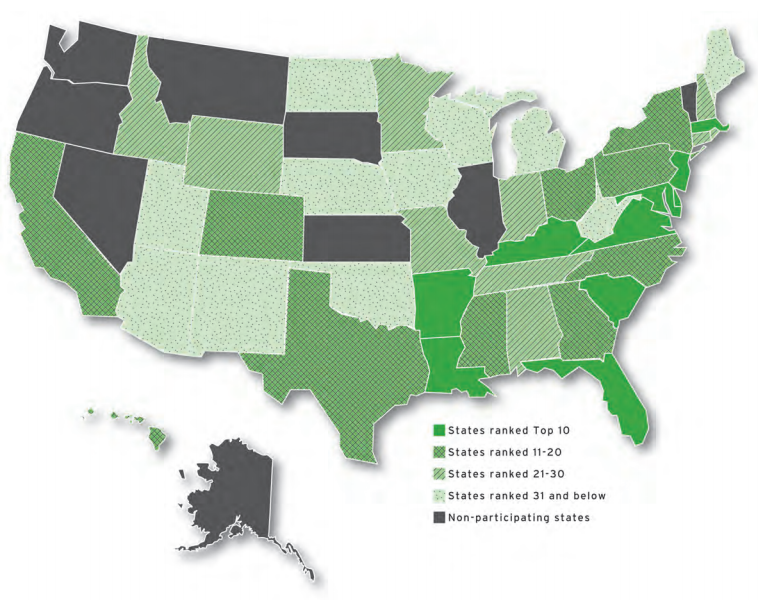 The authors of the report also broke down test score improvements by state, so we can see which states are lagging behind, and which are pulling ahead. Michigan is firmly in the "lagging behind" category.
" ... we ranked states on a “points per added dollar” basis. Michigan, Indiana, Idaho, North Carolina, Colorado, and Florida made the most achievement gains for every incremental dollar spent over the past two decades." Of course, from 1990 to 2009, only three states in the U.S. had smaller increases in per-pupil spending than Michigan. So, our test scores weren't great. But at least we didn't throw away a bunch of money on not-improving. We fell behind on the cheap. And, hey, we've still got those Olympic games to look forward to. At least in London, Michiganders have a real shot.